Serve Up Your Message on the Soup! Capital Soup delivers news straight from the source, making it a trusted, daily news outlet for leaders across local and state government, corporations, education, associations, and the media. Fill out our advertising request form or email ads@capitalsoup.com if you’re ready to advertise with us. Pricing varies based on the ad’s location and its length of advertising time on Capital Soup. Please Note: Advertisement prices are subject to change during legislative session. We can help you make the most of the space you purchase with some tasty add-on services. How will you serve your soup? Your issue. Shape the insider view of your issue by packaging all the information.How Will You Serve Your Soup? Your message. Deliver your message where insiders will actually see it. Your news. 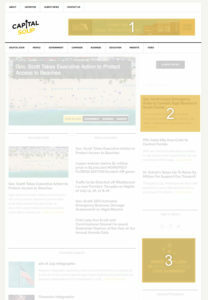 Keep your news in a featured position to ensure that our readers consume it. Your media. Reinforce your story through video, photos, infographics, and memes. Your events. Invite the world to view your news event by posting it on the Soup. Your opinion. Got a point of view? Share it with thousands of readers in a prime position. Interested in putting your message in front of Florida’s thought leaders? Fill out our advertising request form or email ads@capitalsoup.com for details.